Born: 11 February 1707, Le Havre, Normandy, France. Died: 1 March 1780, Lorient, Brittany, France. J.B.N.D. d'Apres de Mannevillette was the son of a French sea-captain and at the age of twelve sailed with his father to Bengal. After his return he studied astronomy and geometry in Paris. During a long career in the French merchant marine, starting as fourth officer in 1726, he visited many parts of the world and collected valuable navigational information. He experimented with improved scientific instruments and navigational methods, was the first to use the octant (or Hadley's quadrant) on a voyage to measure latitudes, and determined longitudes by measuring the angular distance between the moon and sun. He first visited the Cape of Good Hope in 1737 while on his way to China as a lieutenant aboard the Prince de Conti. In 1745 he published an important collection of sea-charts titled Le Neptune oriental which established his reputation as a cartographer and remained authoritative for more than half a century. An English edition, with additions and corrections, titled The East-India pilot..., was first published in 1777-1781. In 1751 his work on navigational instruments and methods, Description et usage d'un nouvel instrument pour observer la latitude sur mer... was published in Paris. It included a discussion of the new English quadrant and various observational methods. In April 1751, as captain of the Le Glorieux, he again arrived at the Cape, bringing the French astronomer N. L. de la Caille* for an extended stay and assisting the latter in his preliminary determination of an improved longitude for Cape Town. He surveyed the Cape Peninsula, but unfavourable weather prevented him from carrying out his instructions to survey the southern Cape coastline. During 1752 he determined the latitudes and longitudes of Mauritius and Reunion, and returned to the Cape in March of that year in command of the Treize Cantons to survey the South African coast. Two of the resulting coastal charts represented a great improvement on earlier efforts and were added to later editions of his Le Neptune oriental. The first, probably based at least partly on his survey of 1752, is titled Carte Particuliere de la Cote D'Afrique depuis le Cap des Courans jusqua la Bay de Ste Helene. Though its author is not mentioned, experts ascribe it to D'Apres de Mannevillette and date it to about 1755. The second, Carte Reduite de la Cote Meridionale d'Afrique, covering all of South Africa, was published in the 1775 edition of Le Neptune oriental... and was included in the C.J. van de Graaff* collection of maps. His other maps include a detailed sea chart of the Cape of Good Hope from Saldanha Bay to False Bay, published in Paris in 1752. It includes soundings in Saldanha Bay, Table Bay, False Bay and around Robben Island and Dassen Island. He also produced views of False Bay and the roadstead in Simon's Bay, as well as a plan of Simon's Bay, in 1775. 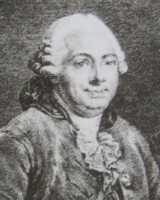 In 1762 the Compagnie des Indes (French East India Company) appointed D'Apres de Mannevillette as director of maps and plans at Lorient, and five years later he was decorated with the order of St. Michael. In 1765 he published his Memoire sur la navigation de France aux Indes, which was translated into English (1769) and Dutch (1770), and served all who sailed round the Cape to the East. The 1768 edition includes descriptions of Tristan da Cunha, False Bay, and Simon's Bay. De la Caille, N.L. Travels at the Cape, 1751-1753, translated and edited by R. Raven-Hart. Cape Town: Balkema, 1976. Forbes, V.S. Some early maps of South Africa. Journal for Geography, 1965, Vol. 2(6), pp. 9-20. Koeman, C. Nuwe bydrae tot die kennis van Suid-Afrika se historiese kartografie. In C.G.C. Martin & K.J. Friedlaender (eds), History of surveying and land tenure in South Africa, Vol. 1, pp. 235-250. Cape Town: Department of Surveying, UCT, 1984.